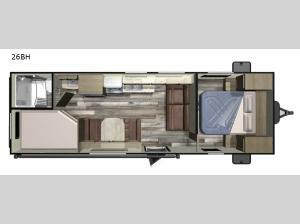 Come enjoy time away from home while camping in this Autumn Ridge Outfitter 26BH travel trailer! With sleeping accommodations for up to eight people this model is ideal for a family with multiple kids or for the family who enjoys camping with friends! Throughout the unit there are plenty of overhead cabinets for you to easily store and access your camping items. Mom and dad can enjoy a good night's sleep in the front private bedroom with a queen bed, and in the rear there is a set of double bunk beds which sleeps four people, plus the booth dinette and the sofa can convert into sleeping spots! In the rear right corner you will find a bathroom where you can easily get ready for the day!